RAMCO once startad as an importer and stockist of lining material. Our long- existing contacts with the world's leading manufacturers is a guarantee for a complete range of products to choose among. We keep in stock, refractory bricks, castables and mouldables of a very high quality for all purposes. One of our special fields is module-built fibre linings with a unique hanging system for electrical elements. Ramco can always furnish the right material and most qualities are kept in stock for quick delivery. 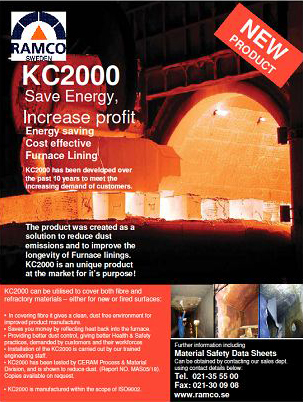 We also do coatings with energy saving products.